We love to find out the various ways our products are put to use. Here we see how provider of sound and lighting equipment, Stage Sound Services, utilise our heavy-duty shelving to store their equipment. Providing services for top theatre shows and events requires expensive, bespoke equipment, therefore it is imperative that there is facility for it to be stored safely and securely, that's where our strong shelving systems help. "Cardiff based Stage Sound Services recently took delivery of 10 bays of racking to add to our existing storage systems. 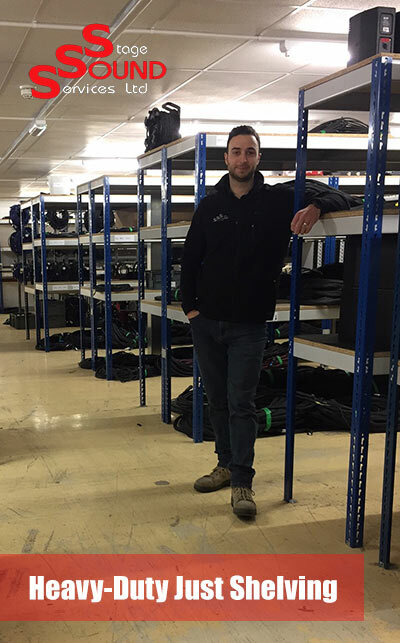 The new racking has been put to use storing audio and visual hire equipment to service customers in the UK and further afield. The Just Shelving racking is quick to put up and gives lots of flexibility when choosing shelf heights. ESE were quick to deliver and had the best price around!" For more information about Stage Sound Services visit their website: www.stagesoundservices.co.uk.